He has not been given a water bill in the last 16 years, and the BWSSB doesn’t mind a bit. A R Shivakumar, principal researcher of Rain Water Harvesting, KSCST, and his family of four, have been meeting their daily needs with rain water for the last sixteen summers. Shivakumar offered to take us on a tour of his eco-friendly house Sourabha, in Vijayanagar, to display his advanced rain water harvesting system that makes him completely independent of Bangalore Water Supply and Sewerage Board (BWSSB). Shivakumar’s wife Suma is used to his eccentricities as a scientist. But when he suggested that they forego a BWSSB line completely, in the new house they were building in 1997, she thought it was extreme. He convinced her then that she would not have to depend on neighbours for water, and eventually ended up building the house without depending on BWSSB. Shivakumar has a two-level roof with two overhead tanks on each level. The roof acts as a catchment area connected to the second floor tank which is in turn connected to the linked underground pumps. “During a full season, I have 45,000 litres of water in my house which can be used for 110 days. And in the last 100 years, the time gap between two showers in Bangalore has never exceeded three months. In Bangalore, we get about 40 inches of rain and with my surface areas, that translates to about 2.3 lakh litres of water every year. As a family of four, we use about 1.8 lakh litres of water. Where is the question of shortage?” he says. But he does have a back-up for a (non) rainy day. The excess 50,000 litres of water that is not stored by the family in any of the tanks is directed to a shallow borewell which has water within the first 30 feet. For clean drinking water, he uses a silver sheet that is immersed in a 10 litre tank. Put it in the water for six hours and what you have is zero-bacteria drinking water available, he says. 5 Responses to Water way to be! That is pretty ingenious. 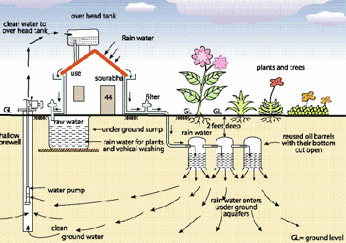 All houses should be set up like this, at least in areas where there is enough rainfall to make it work. I found your blog interesting. Our Organization, Liberty Institute, plans to send copies of the report of the NOn-Governmental International Panel of Climate Change (NIPCC) to scientists and activists interested in related issues. I found this interesting. My son is doing project on this topic can you send some documents/information. It is the most interesting and nice post I have come across. We all should get inspired by shivakumar and his wife. It’s very innovative idea to save rain water. We should never forget that water is a limited resource. So, use it carefully.